This is a great site with lots of interesting details. My favourite is Blodget's Battle of Lake George 1755 picture with its fascinating descriptions of the action. 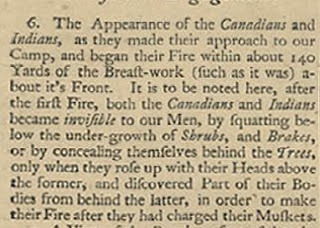 This description of Canadians and Indians is an insight - see how the idea of using shrubbery for cover was something very novel to his eyes. Northern Sound is a family run business, based in Buckinghamshire. We design and build a range of canoes, inspired by Native American techniques, methodologies and materials. The canoes we offer are ideal for intermediate paddlers, traditional enthusiasts, and outdoor activity groups. We believe traditional aesthetic can be delivered hand-in-hand with modern durability. Our canoes are built to be used. Time to get out on the river and lakes Indian style. New art print by Robert Griffing. I'm going to feature contemporary American frontier art, as its an interesting genre and the research is usually first rate. 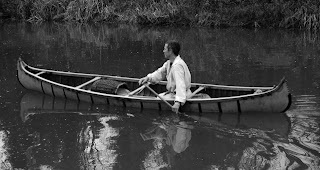 One of my old reenactment friends now makes birch bark canoes - I'll have to ask him if you really can stand up in one...presumably you can. 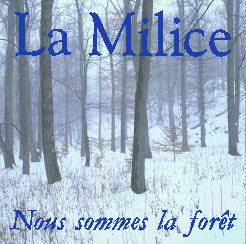 This is one of my favourite 'Milice' pieces of artwork. Created by Le Detachment - a Canadian Militia Group. 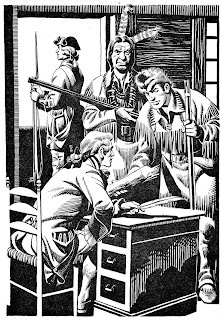 Another piece I like is this one by Francis Back for the Company of Military Historians depicting Milice on frontier service 1750-60. 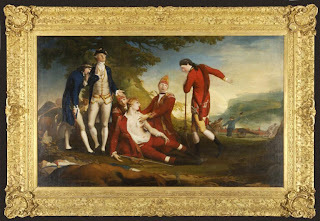 Probably the depiction of the Death of Wolfe that is considered the most accurate is this one dated 1763 by Edward Penny. 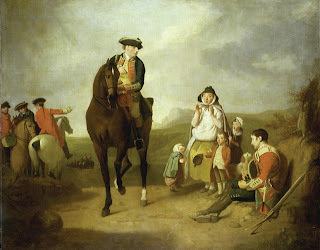 He also painted another crucial image of a Seven Years War redcoat in his Marquis of Granby giving Alms to a sick Soldier and his Family which also shows a rare glimpse of the camp follower of the time. Both images from the Ashmolean Oxford. Just for a bit of balance I thought it might be interesting to look at some different depictions of this famous scene. This one I have never seen before - by James Barry 1776 - story here - it suffered apparently by being unfavourably compared to the Benjamin West version and was withdrawn. 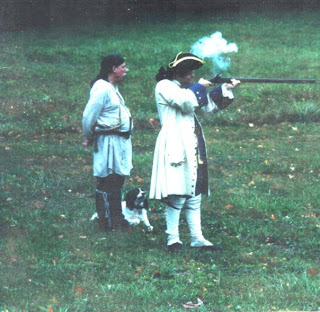 Thought I'd try and find a photo to show a model to demonstrate the proportions of this French musket that was issued to Canadian militia. This instance I was firing a silk-patched ball at a small brass gong at about 100 yards and was able to hit it in about three goes (under the tutelage of Andy Gallup and his dog Jolie). I am in the guise of a French Marine officer just off the boat - though of course most Compagnies franches de la Marine officers were from the Canadian nobility raising from the rank of Cadet. The Fusil de chasse was smaller in calibre to the standard English weapon the Long Land Pattern. This is an edit of a piece I wrote for my old reenactment newsletter 'The Bloody Morning Scout'. 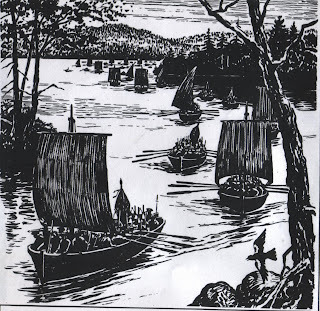 'The unsung heroes of North America were the French Canadians, who were out numbered to the order of twenty to one by the English colonies and yet contrived to maintain the balance for so long through their mobility and skills with woodcraft and weapons'. Chris Duffy Military Experience in the Age of Reason. Canadian Militia - present in all the engagements, usually the largest component part of French forces - often misrepresented or ignored these irregulars were the prototype light infantry unit in America. Organisation All men able to bear arms between 16 and 60 were mustered by Parish in Companies. For specific expeditions and campaigns outside the Parish volunteers or specially selected men were brigaded into groups of three to four hundred under a Colonial officer whose name the brigade normally held (eg brigade de la Corne etc). Company organisation may have existed in brigades probably by Parish with NCOs and officers a mixture of Militia and Colony troops. Colony troops and Militia often came under the description 'Canadian' troops as many of their roles and equipment were similar. Clothing and equiment Those going on campaign were issued with clothes and equipment which would mean a certain amount of uniformity within Brigades though this is before the colour coded tuques often mistakenly attributed to this era. 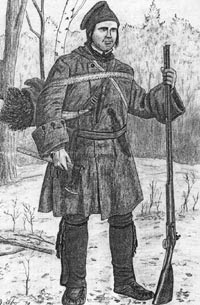 The appearance was typical clothing for a voyageur - a knitted cap (tuque) usually in red or blue, not long like a stocking cap of later times but more like the bonnet rouge of the French revolution or Monmouth cap. Wool leggings that sometime carried decoration coupled with beef shoes or mocassins and a long linen shirt and wool breechcloth. Knives around the neck, at the knee and at the waist (covered in a wool sash) were typical and axes and awls also were supplied as well as powder horns and musket tools. 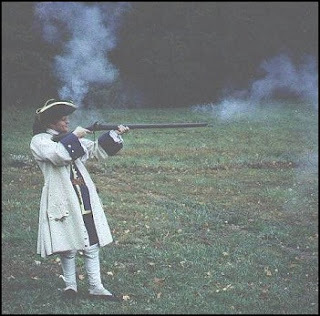 The Musket was the Tulle hunting fusil - a slender accurate weapon that was also popular among Natives though sometimes an inferior musket might be brought in place of the ones issued or so was the complaints of the officers at the time. In winter a capote - a hooded woolen overcoat was issued - closed around the waist with a sash. Burdens were carried Indian style with a tumpline and their 'tents' were simple canvas squares that were suspended from bsuhes etc. Tactics The Milicien was the skirmisher of the F&I wars although this 'skulking' method of war was despised by regulars on both sides. 'Courageous only when behind a tree' or 'savage and hidden rascals' are typical comments from the era. Miliciens were able to load their fusils while lying down - something that caused problems when they were incorporated into regular battalions such as at the Plains of Abraham. Giving ground to create ambushes - working around the flanks - these tactics were put to good use at Canadian victories such as Monongahela. 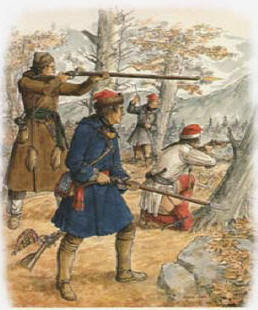 When European tactics were used such as by Dieskau at Lake George and Montcalm at Quebec it had disasterous consequences for the French and it was generally to the horror of the Canadian and Colony troops who had been fighting a different sort of war for generations to see these defeats. 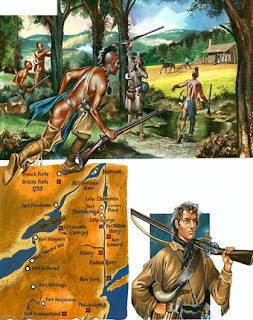 Often mistaken for Coureurs de bois - whose notoriety in the 1680s and 90s created a legend among Anglo Americans - these Militiamen were law-abiding colonists though their experience was completely different than their American counterparts due to a less dense population and an involvement in the fur trade. In popular culture. 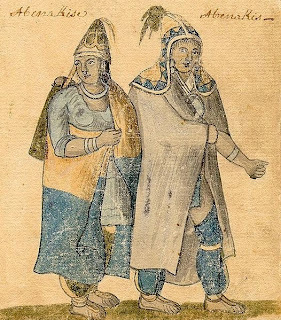 They have largely been ignored in the mythology of the Eastern frontier. Following on from Lance's piece on Ron Embleton I thought it might be interesting to look at American artist Frederick Ray. 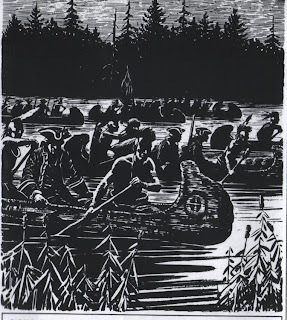 He used to work for DC and drew Superman among others but had an interest in the colonial period - these images of craft on Lake George are very typical of his monochrome style. First piece from new contributor Lance Cawkwell from Galloping Major wargames. Excellent stuff. Here are a couple of line illustrations taken from a 1959 Hawkeye Annual I spotted when passing a second-hand book stall in London a few years ago. 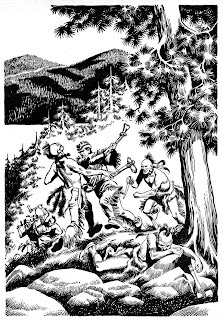 From a distance the style of the cover illustration caught my attention, closer inspection confirming that it was some of the early work of my boyhood hero illustrator, Ron Embleton. 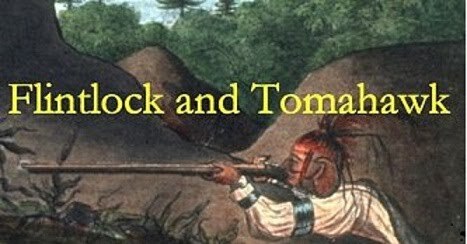 I remembered the TV series it was based on, but had not previously seen this book, first becoming aware of Ron’s work for “Look and Learn” several years later, which to my delight often featured the French & Indian War and related subjects. Although the subject matter and treatment of Ron’s illustrations for the Hawkeye book reflect the nostalgic charm of a late 50s young target market publication, the connections to the superb colour work he would produce for “Look & Learn” and other publications are clearly there. Ron Embleton was one of the all time greats in my opinion, and a source of inspiration. Great theme song - I think we should all make an effort to learn it for the next camp fire we attend. This slice of Americana was the inspiration behind the movie The Patriot with Mel Gibson before he got at the script and amended it. The character Francis Marion was of course the inspiration behind this series. According to the wiki it was banned in Canada due to its portrayal of Loyalists and British soldiers. I'm quite a fan of these US made 1/32 figures and forts - they seem to appeal to my sense of nostalgia for a time when every kid had a fort. They're also a kind of homage to the Americana of the 50s when playsets covered historical events with a range of buildings and vignettes. They have a Daniel Boone theme at the moment. It's interesting the response to the new Galloping Major Miliciens. A lot of people have said 'what are they' - it's not a surprising response - they don't have the profile of Rogers Rangers and therefore aren't really in the consciousness of wargamers or reenactors...why is this? 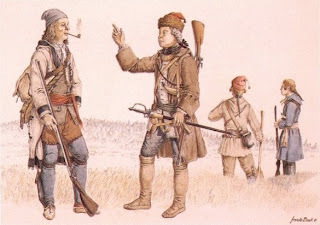 Maybe it's because they are Militia - that usually means low grade troops though in the case of New France Militia only the best were selected for expeditions against the enemy - the rest were used for carrying materiel and supporting the supply lines. 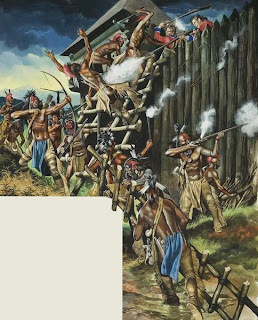 It might be because the artists that depict the French and Indian wars tend to focus on other types of troops - you have people like Gerry Embleton and Gary Zaboly illustrating British troops - you have a wealth of romantic artists depicting Woodland Indians but on the whole very few people are interested in showing an obscure unit like Canadian Militia. And so it goes. There is no market so noone tries the subject - it isn't part of the mythology and therefore no one knows. It could be the fault of the early Osprey for Montcalm's Army. Nowhere near as well illustrated as Wolfe's Army it featured some fairly erroneous depictions of Coureurs de bois and Miliciens...both pretty wide of the mark. Anyway I'm glad Galloping Major went the less obvious route. They could have played safe and done Rogers Rangers but we'd still have no Miliciens in summer kit. They are to be thanked for that. As for artists - Francis Back (colour pic) is well versed in the Canadian Militiamen and Jeff Lebo (b&w pic)- both Canadians - their stuff is excellent - other than that there's not much out there. I'm going to try and dig out some old articles on Miliciens and start a bit of a theme. Interesting documentary about this momentous gathering in Montreal. I don't know whether you noticed that some of the new Armies in Plastic 1/32 F&I figs were designed by John Jenkins - this seemed to me to be a brilliant idea - a marriage made in toy soldier heaven. 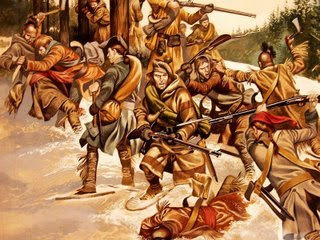 JJD are makers of high quality and very historically accurate Seven Years War figures - usually in themes such as the Mission at St Francis, Battle on Snowshoes, Monongahela and so forth. Way out of my price range but I have always checked out their site to see some of the loveliest toy soldiers on the market. 18th century. 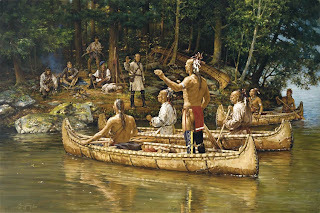 Been reading about Father Rale and his time with the Abenakis at Norridgewock. Canadian biographical dictionary has a fairly detailed biography of Rale. Going to do a bit on some of the obscure units of the Seven Years War in America. This one was only in existence for a short length of time but it is an interesting unit. In the UK we had this unit being reenacted for a while...I'll see if I can dig out a photo. Looking at the 'Armies in Plastic' Rangers I was wondering what conversion potential there was - I'm not a huge Rogers' Rangers fan and that's part of the fun of 1/32s - the conversion potential. So this unit - in their brown coats - might be an interesting alternative. 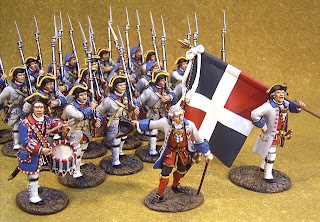 Historical information on the regiment is at this blog where there are some Front Rank 28mms painted and here where an even more detailed history is to be found. Image is from the Company of Military Historians site where you can buy a print and detailed history. As far as I know Gage's were recruited from locals and the brown was very much a Yankee colour. Rogers Rangers set will contain 16 figures in 8 poses. Both Indian sets will contain 18 figures in 6 poses. Another interesting reconstruction. I make no apologies for all these clips - I am old enough to remember life before the internet and the availability of these on demand is something I treasure. For a French sympathiser - as I am in the F&I - this is one of the best battles to learn and read sbout - a classic ambush by a numerically inferior force. This sequence depicts among other things Beaujeu painting himself black before the battle. Excellent little documentary on this, perhaps one of the most famous of sieges in the F&I war. Depicted in LotM this was a French propaganda disaster with the so-called massacre that followed it became a cause celebre for the Yankees. Recently this view of the aftermath has been challenged in such books as 'Betrayals' by Ian Steele which I recommend to anyone interested in trying to understand this event. One of my favourite all-time 'Easterns' is this one - actually in colour unlike this trailer - has lots of frontier flavour as it tells the story of newlyweds the Martins who are trying to live during the American Revolution having to deal with Indian and Tory raids. Comical and tragic in equal doses it deserves much more attention than it gets...quite simply Ford at his best. From Bridgman art. 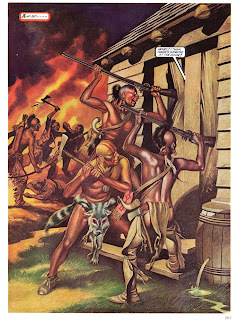 A couple of nice images of natives storming a stockaded fort. I am slightly reminded of John Ford's 'Drums Along the Mohawk' by these pictures. Interesting story of Rogers and his 'nemesis'. 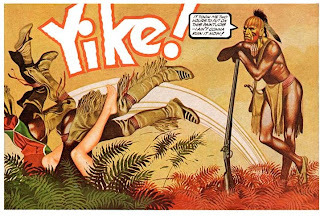 As we're in Rogers' Rangers territory I thought we might as well have some more artwork from the great British artist who popularised the Eastern frontier for a lot of us back in the old days. 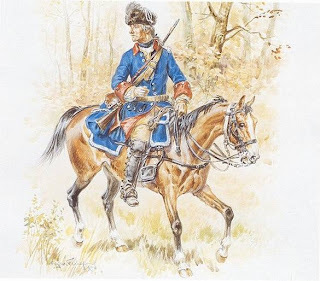 He was a great fan of the French and Indian war and inspired a lot of people in the UK. I hope to feature a lot of his work - if any of you out there have annuals or old comics I'd love to see more. This old Hollywood movie is another source of inspiration for a UK based French and Indian war fan like myself. I am sure you have all seen it. Watching it with hindsight it has a lot of flaws - the Rangers clothing for one but most of all its terrible depiction of Indians, but there are some good bits and if you can stand the racism it's still worth watching. The scenery and settings are superb, the boats and buildings like the mission at St Francis are well done - even the odd regular - like in this scene are well rendered. I once had a dream that 'they' were remaking this film but making it more authentic - I dunno I still think it would be a good idea and I'd watch it... I didn't know there was a tv series in the late 50s based on the movie. 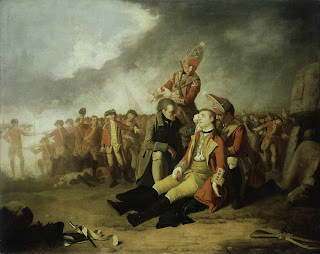 I used to run a French and Indian war reenactment group in the UK and as a result of that you tend to get an insight into the things that got people into the period, what things inspired a lifelong interest. In Britain this tv series from the 60s was influential on people of a certain age - it might not seem impressive now but back in the day this series was unbelievably enjoyable to a youngster interested in history. One of my reenactment buddies was actually on holiday in the Highlands of Scotland and happened on them filming this - something unforgettable I think you'd agree - bumping into Hurons on the warpath in Scotland. History Channel doc - other parts are up. 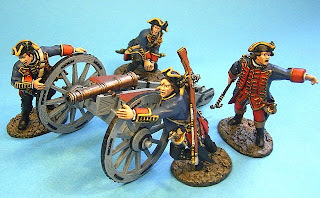 One of the aims of this blog is to popularise the War of 1812 among reenactors and wargamers as we approach the bicentennial. For some reason Hollywood has pretty much ignored thi war apart from a few depictions of the Battle of New Orleans and therefore the profile of this war is low. My interest is in the frontier warfare and Indian fighting that went on and this is a terribly overlooked aspect compared to say the naval actions. Tecumseh is a name in the conciousness but on the whole the image of the War of 1812 is British and American regulars fighting it out in silly hats. Hopefully we can draw attention to those elements that make it the final chapter in a series of wars that took place in North America. This is a great home-made documentary on one of my favourite battles of this era. There's not enough people making Wayne's Legion figures. 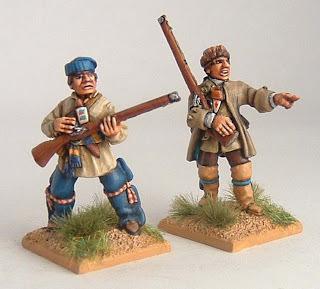 Galloping Major have some great pics of their new Canadian Militia figures on their website. There's also some great photos on the Gallery page with size comparisons with Redoubt. This looks like being a well-researched and executed range that will set the bench-mark for the French and Indian wars. It's about time someone did some decent Miliciens - they're not an easy force to find out about - the only mainstream book on the subject The Equipment of New France Militia, 1740-1760 by Steve Delisle went out of print and now commands high prices.